This week we launched Custom Bots, a powerful new way to build completely customizable chatbots that work right in the Intercom Messenger. Powered by our Operator bot, these bots open up incredible new opportunities for helping you to turn your website visitors into paying customers. Combined with all the new apps in our Intercom App Store, these Custom Bots will make sure that both you and your customers get exactly the right outcome. Here is a recording of the launch event we held to announce and explain Custom Bots, and below is a transcript of the video, lightly edited for clarity. Paul: Hey everybody, I’m Paul and I run our product team here at Intercom. Will: Hey I’m Will and I’m a sales manager here at Intercom. Paul: Thanks for tuning in. We have a big launch for you today and we’re excited to share it with you. We are solving a real problem almost every business has, and that is growing your business faster by turning more of your website visitors into great paying customers. We’ve built a new product that automatically increases qualified leads for your sales team, accelerating your sales process, and therefore maximizing the efficiency of your sales and your marketing team. Will: Yes, so today we’re launching Custom Bots. It’s powered by Operator, our bot technology, and if your business has a website, this is definitely going to help you grow your customer base and make your sales, marketing, and support teams more efficient and hopefully a little bit happier as well. Paul: First, though, we wanted to set the scene a little because what we’re launching is a little different from the older, default status quo tools that people historically use. Here at Intercom we believe that the future is one where all businesses will have a messenger on their website and their app. This messenger will replace the tools they use today like email and forms. Messengers, as we all know, have become by far the dominant way people interact in their personal life. This is also happening in business, and for the same reasons – messengers are faster, more powerful, they’re much richer, and more personal than the existing older channels like email. Earlier this year we launched a brand new messenger for business with apps deeply integrated into the experience. Last week we launched our public app store where you can get over 100 apps for Intercom. Apps help people get things done right there in the messenger, without having to go off to another tool. Things like booking meetings, making voice and video calls, signing up for webinars, viewing all sorts of different content that you might want to showcase. In our app store we have Salesforce, HubSpot, Marketo, Google Meet, Google Calendar, Shopify, Stripe, MailChimp, Aircall. Paul: The list goes on. Will: There’s loads. Our entire customer base now is using the new messenger and seeing amazing results. We’ve already seen businesses shortening their sales cycle, selling at an even faster rate, decreasing response times, booking more meetings, selling right there and then directly within the messenger. Our messenger launch completely redefined what a business messenger can do, but that was just the beginning. Today is the next step – adding much more powerful bots to that messenger. Paul: Bots have matured a lot. The technology has evolved and matured over the last few years and here at Intercom we are seeing clear differences between what people are great at and what bots are great at. We’ve heard a lot from customers wondering when should you use a bot and when should you not use a bot. Bots bring some big advantages to the marketing and the sales process and we in our experiments have found there’s key differences, key advantages, and there’s five that we think are important for this launch today. The first is that bots can easily take over the mundane, repetitive work your sales team do today, so giving them more time to talk to high quality leads and do only what people can do best. Will: This has been huge for my team in particular. We can spend more time now closing deals, not doing work that could be automated. Paul: That’s the first thing. The second thing is that bots work 24/7, collecting qualified leads while you sleep. Rather than your sales team having to come in and manually qualify lots of people, they come in to set up highly qualified leads with meetings already booked. A third is that unlike people who are sometimes unavailable, which is okay and understandable, bots are always available, they reply immediately, they get answers faster, they provide a great customer experience, and they move leads down the funnel. Will: Yeah, so this can be a huge weight lifted, guaranteed responses to prospects at all hours. A large part of our sales team success is getting back to customers in a timely manner. So bots are really helpful in that regard ensuring a quick response and then letting a human jump in when they’re needed. Paul: Yeah, the best of both worlds. The fourth thing we found is that because you wrote them yourself, bots are dependable, consistent, and they’re always on script, so you can predict what’s going to happen with a bot. The fifth thing of the five is that because the bots are programmed and they don’t need human intervention, the bots can deal with many, many, many customers at once, hundreds of customers at once, thousands, so you never have to worry about scale. You can have many, many more of your website visitors getting qualified with the bot without having to worry if it’s scaling up your sales team. 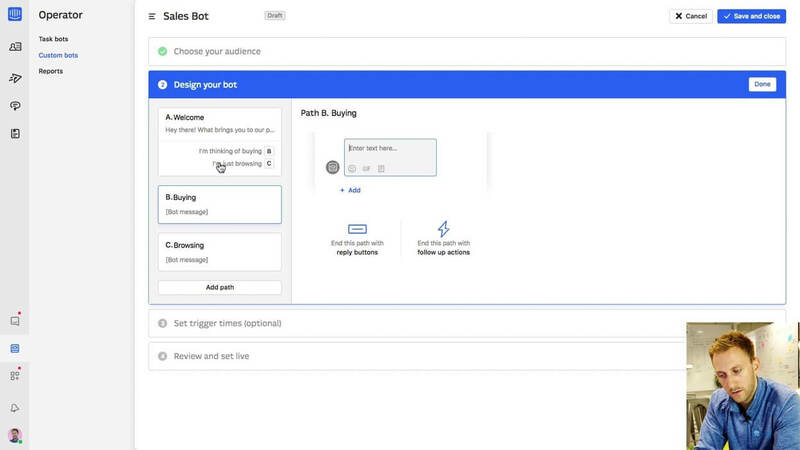 We’ve been designing, building, and using bots here at Intercom for a couple of years, and we’ve learned that these things as we’ve tried out different things and we can now clearly see the huge potential in marrying bots and people to grow your business faster. Will: Last year we launched our bot technology. It’s called Operator, and it performs tasks like inbound lead qualification and customer routing. Operator delivers huge business benefits for our sales, marketing, and support teams and our customers, and today we’re making it much, much more powerful. Paul: Yeah, so today we’re launching Custom Bots, and there are a few big parts to it. These are the four big things that we think are brand new and really useful for you and your business. The first one is that you create your own bots for your website. This includes asking people on the site questions, providing them buttons, predefined answers, and then moving them down different customer journeys which we call paths depending on their answers. Let’s show you the concept here just to give you an idea. In this case it’s asking what brings you here today, and the visitor to the website could be one of two states of mind, they can be ready to buy, or they’re just browsing, they’re still doing research. Let’s imagine that they say they’re just browsing, they’re in that research mode, and they click just browsing. You can customize what the bot says next. It says no problem, let us know if you need anything. And so it drops in an email form here and says thanks very much. Unlike other bots that have existed in the past, we believe that no lead should be left behind, no dead ends. Even if someone is just browsing, you want to collect their email because you might want to add them to a nurture campaign or a drip campaign or get them integrated into your marketing stack. Some people of course are in buying mode and so they say they’re thinking of buying. This is a different path, this is the buying path, where you can ask some questions and enter into qualification. So the first thing is that you can create completely customized bots with customized paths for your website. The second is that you can have these bots message people in a highly targeted way. For example, you could have different bots on different pages of your site, then you can have a completely different bot with different paths on a different page. You could trigger based on how long someone’s been on the page. You could trigger based on how many times they’ve visited that page or their country or language or even what page they came from before hitting your site. 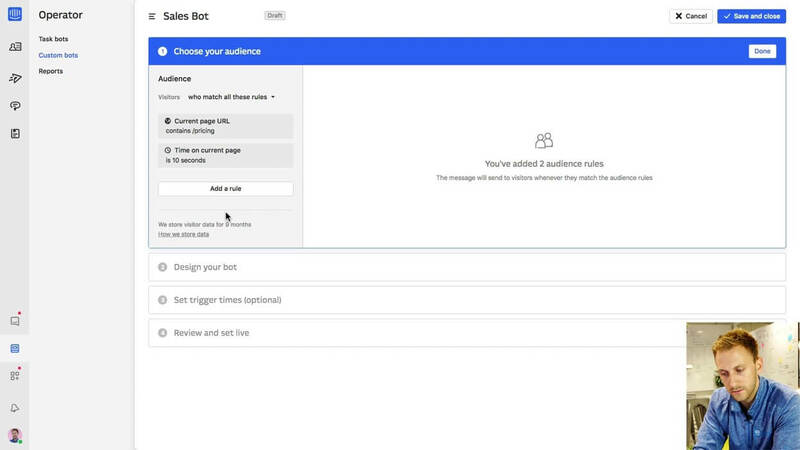 So you can connect this up to your marketing stack, you’d be running ad campaigns and then directing those visitors into these custom bot workloads. The third is that you can design what we call follow-up actions into your bot. 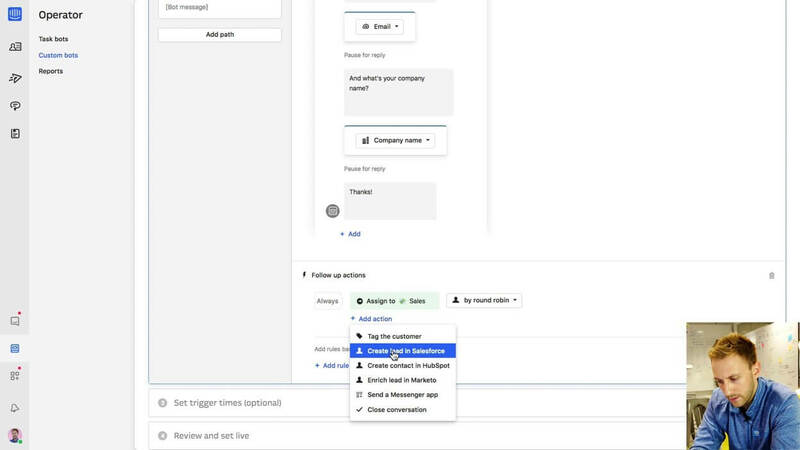 For example, depending what answer the person on your site gives you, you can tag them in Intercom, you could add them to Salesforce, you could add them to HubSpot, you could assign them to a specific person in your company, for example the account owner. That’s the tip of the iceberg. Fourth is that you conclude the bot with a Messenger app. This is I think the biggest deal, because it gives you such huge efficiencies in your sales process. We’ve seen this internally, we’ve been using Messenger apps at the end of our bots, and this is where our new Messenger really, really shines, with this app store and all these apps. 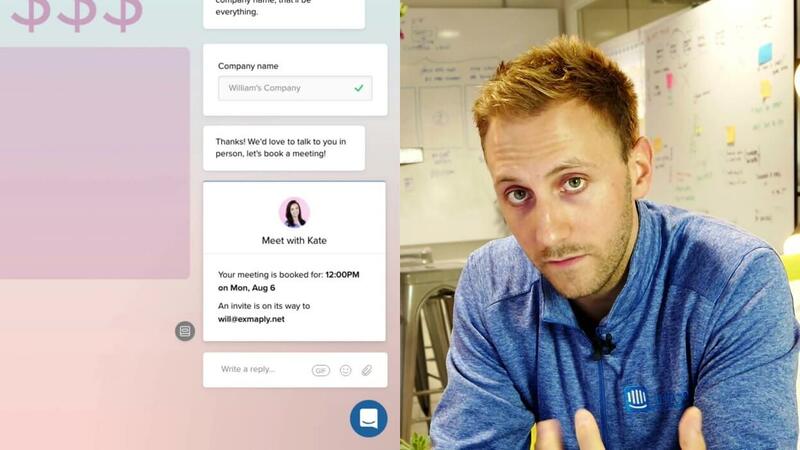 Depending on the lead’s answers, you can have your bot insert any app you choose into the conversation, for example a meeting app to automatically book a sales meeting, connect it to Google Calendar and order a bunch of things, have them automatically join a webinar right there. Again, so many options with over 100 apps in the app store. On top of all this, of course we have reporting. We’re going to show you how your bots are working for you, show you your return on the investments in these bots, and most importantly is showing you how they’re delivering more high quality leads faster than ever before, faster than your sales team can do manually, all without the intervention of anyone in the sales team, which obviously saves you time and money and honestly makes the sales team a lot happier, not doing all this manual work. Anything else? Will: The final thing it’s super easy to set this up. No coding experience required. You don’t need to be a developer. The editor is quite intuitive, it’s WYSIWYG so what you see is what you get, you can get started with this in just a couple of minutes. Paul: We’ve put a lot of time into trying to make this easy for people to use and so fast to get set up so we should show you how that works. Will: Let’s first take a look at what a visitor to our website is going to see when we launch one of these Custom Bots. This is an example pricing page for purposes of the demo. After being here for a little while our bot is going to trigger. We’re asking them what brought them here today, and we’re giving them just a couple of options, so are they thinking of buying or they’re just browsing? We could have as many of these options as you like, and each one of them will take the user or the visitor on the different path, a different customer journey. Let’s walk through that now. They’re thinking of buying. We’ll start to take them down a path, specific to somebody who’s interested in purchasing our products. We know that we might need to qualify them or ask them for a bit of information in order to help them well. So we’re asking now what their name is. “William”. I’m having a bit of a dialogue. I’m requesting a bit more info. And then finally we’re going to ask for their company name. Let’s call this one “William’s Company”. You can ask as many of these questions as you like, and it doesn’t just need to be inputs like company name or email. It could be company size. It could be the things they’re interested in buying. It could be who they’re currently using or working with in this space. Anything that your team needs in order to determine value and figure out who they should or shouldn’t be spending their time with and how to respond to people appropriately, you can gather using this custom bot. All this language is entirely bespoke to you. You’re going to write it, you’ll customize it, you’ll choose when it says what. In this case we’ve got that information and we’ve identified that this is actually a really hot lead, someone who wants to work with us and have given us really awesome information and I’m going to let them go ahead and book a meeting. We’re going to let this person book a meeting with Kate. It will let me know it’s booked, and then when Kate comes into the office she has a relevant, registered hot lead in her inbox ready for a call. She didn’t have to do any of this. It just worked for her. Again, if Kate wants to, she can customize this script, she can have it say what she wants it to say, speak her language, her tone, depending upon who the audience is. A lot just happened there and it might look simple but let’s go into the hood and see what happened. I’m going to go into Intercom now and I’m going to have a look at my leads. I should see a brand new lead here at the top. I’ve got William from William’s Company, any information that I’ve gathered will be here, and again this is now there for Kate to review. She can use it to get ready for a call, a registered lead inside of Intercom. This is all great, but I want to show you guys just how easy it is to produce these bots to create. I’m going to go to the bottom left here in the menu, I’m going to click on Operator, and I’m going to take us to Custom Bots. Here’s the bot that we sent earlier on. There’s some basic stats about it. There’s deeper reporting to offer as well. But we’re just going to jump into building our own bot now. I’m going to give this a title. I’m going to call it the Sales Bot. There are four states that we’re going to move through. 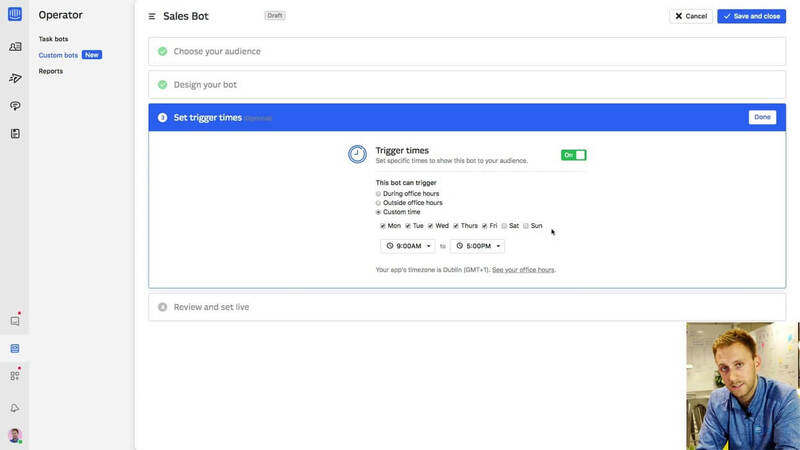 We’re going to choose our audience, we’re going to design the bot, we’re going to tell it when to send to people, what times, and then we’re going to review it and let it live. Let’s choose the audience first. We probably want to send this one when somebody’s on our pricing page. A good expression of intent might be somebody has been on this page for more than 10 seconds, and you can add lots of additional rules in here and you can make it such that maybe they’ve been to other pages before now, so you can start to really identify who is and isn’t interested and tailor the message to them. But once we found the audience, we’re now going to go ahead and design our bot. Now this is where it gets really interesting. We can add as many of these replies or buttons as we like, each taking the visitor down a different path specific to that journey that you want them to have. In this case we’re going to have two and I’m going to select two paths. I’m going to create these two new paths. The first path B is associated with I’m thinking of buying. The second one is browsing. Our paths will be listed here on the left hand side and we can move between them freely, customizing them. If they click on “I’m thinking of buying”, they’ll go to the buying path. Let’s click on that now and let’s start to customize it. We might say, “Awesome. In order for me to help, help you make a decision, could you share some extra information with me?” We might put in an emoji just to make it really friendly. We’re imagining that these are specific to our sales process. This is information that we need to gather in order to offer a visitor, a leader, a prospect a really good buying experience. If you segment your sales team into small business, medium, enterprise, or maybe you look at different markets or different industries, you can collect the information that you need in order to properly route this conversation to the right team member in order to properly configure the right follow-up action. Now that we’ve collected this information, we’re going to thank the visitor and we’re going to add in here some extra actions. They’ve given us this information. We know they’re of value. Now we’re going to go ahead and assign them to the sales team, and we’re going to do that via a round robin. We can send it to specific people. We could send it to teams, and we could just pop it in there, or we can round robin it across the team. We’re also going to create the lead in Salesforce, and finally we’re going to add a messenger app. This is where it gets super interesting. Again, people don’t come to you to just have conversations. They come to get things done. This is what that is. This is allowing a relevant prospect to book a meeting with somebody that can help them. This is good for the user, but it’s also good for your business. These are real outcomes. You don’t need to be involved, and remember, Kate, our rep, she is not going to have to book this herself. She gets somebody who fits the qualification criteria booked into her calendar. These apps could also allow you to maybe set up a conference right away, a Zoom meeting, you could deliver your knowledge base, you could even start to do things over time like allow people to update their subscription or add team mates to the service that you offer if that’s what you’re doing. You can maybe present some buying options and allow them to complete transactions within the messenger itself. Messenger apps allow you to do a whole host of different things and allow you and your user to complete work flows. No leads left behind, no customer is a dead end. Always something can happen, it’s beneficial for both you and them. Now that we’ve done this, let’s imagine actually that we didn’t qualify this person and they wanted to just browse. We might end that flow by tagging the customer as a nurture campaign, so we’re going to market to them. We might pop that lead into Marketo and we might go ahead and close that conversation right away. I’m going to now move on to telling Intercom when it should send this bot, when do we actually want this to fire. We can choose to send the bot during office hours, maybe when we’re not in the office, or we could set up custom times across different days of the week. If you’re in the office maybe you want to offer a certain type of bot experience. If you’re not there, maybe you want the bot to reference that and say different things. This is completely customizable, all the responses, the paths, the follow-up actions, the things that happen. When these things happen you’re in complete control of that, it’s for you to decide. I’m going to set it live, and then we’re going to have our bot speak with visitors and prospects, help our support team, marketing and sales team, book meetings, resolve queries, send articles, knowledge base answers, and even collect emails for marketing campaigns, all without having to involve ourselves and only involving ourselves when it’s really needed and we can really create value. This is just one bot. This is a sales bot designed to help you qualify your leads and sell to them better, make sure they get the right support and help, but this equally could do many other things. Maybe you’re an eCommerce company and you want to set up a bot to send to people when they look like they’re about to abandon their cart. Maybe you want to help them find new items or learn more about what they’re looking for and then make recommendations to them. Maybe they’re on a support page looking for help and you want to use the bot to better identify what their issue is. Maybe send them a help article that can assist them in that situation. Messenger apps in combination with these bots allow you and your customers to get more done. Again, we’re not just gathering information but we’re actually doing things with it, we’re producing desired outcomes for both parties and we’re making it such that it’s easier than ever for your teams to focus on the right type of work. Paul: The power of these messenger apps as next steps for your visitors is honestly the real game changer here. You can build really sophisticated flows with no dead ends, as you said earlier, no customer left behind, no lead left behind. You can make sure you capture visitors, get them into your funnel so they can reach the most valuable step or the most valuable outcome that they want. There are some custom bot templates that we’ve built right there in the app. You can start in less than a minute if you wanted to. Thanks for tuning in. We’re so excited to see what you create with a powerful combination of the messenger, our apps and app store, and Custom Bots. Will: Yeah, thanks for tuning in guys. I’m super excited to see what sales, marketing, and support teams do next with this. It’s going to allow us as reps and individuals at businesses to focus more on what really matters, understanding our customers, solving their problems, and creating real value that only a human can. I’m super excited. I hope you guys are too. Thank you for tuning in. 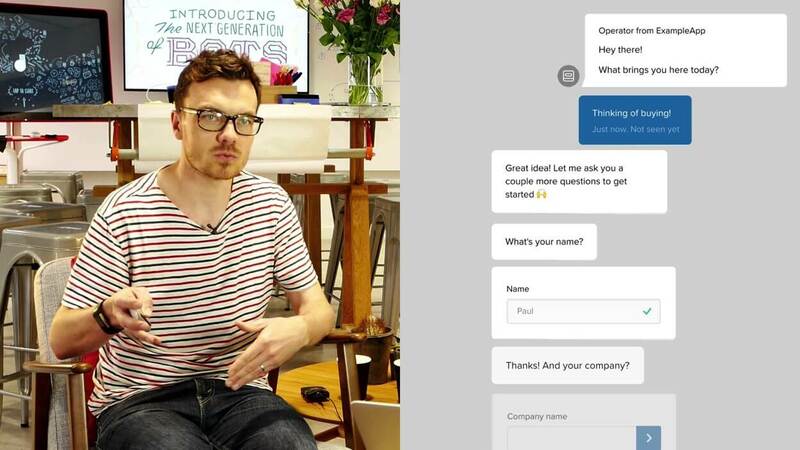 Paul: To find out more, you can interact with our custom bot on intercom.com and you can talk to our sales team, our support team to find out what Custom Bots can do for you. That’s it. Thanks very much for listening.